William Harold Dean Jr. (born April 2, 1962) is an American country music singer and songwriter. He first gained national attention after appearing on the television talent competition Star Search. Active as a recording artist since 1990, he has recorded a total of eight studio albums (of which the first three have been certified gold by the RIAA) and a greatest hits package which is also certified gold. His studio albums have accounted for more than 20 hit singles on the Billboard country charts, including 11 Top Ten hits. In 2000, he had a Billboard Number one as a guest artist along with Allison Kraus on Kenny Rogers' "Buy Me a Rose", and had two Number Ones on the RPM country charts in Canada. Dean's first single was "Lowdown Lonely", which did not enter the charts. It was followed by "Only Here for a Little While", the second release from his debut album Young Man. This song and its follow-up, "Somewhere in My Broken Heart" (previously recorded by Randy Travis on his 1989 album No Holdin' Back) were both No. 3 hits on the Billboard country charts. The latter was also a minor hit on the Hot Adult Contemporary Tracks charts. Young Man was certified gold by the RIAA. Billy has taken over the lead role (formerly played by Kenny Rogers), playing Hank Longley, in "The Toy Shoppe" (a musical written by Kenny Rogers and Kelly Junkerman) at the Starlite Theater in Branson, Missouri, through the end of 2013. ^ a b c d Loftus, Johnny. "Billy Dean biography". Allmusic. Retrieved November 30, 2008. ^ a b c d e f g h i j k Stambler, Irwin; Grelun Landon (2000). Country Music: The Encyclopedia. Macmillan. pp. 124–25. ISBN 978-0-312-26487-1. 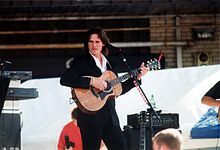 ^ a b c d e f g "Billy Dean biography". Oldies.com. Retrieved November 30, 2008. ^ Flint, Joseph H.; Nelson, Judy A. (August 24, 1993). insider's country music handbook The insider's country music handbook Check |url= value (help). p. 82. ^ Billboard – Google Books. Books.google.com. April 10, 2004. Retrieved March 25, 2012. ^ "Archived copy". Archived from the original on November 15, 2013. Retrieved 2013-11-17. CS1 maint: Archived copy as title (link) Retrieved 2013-11-16.